providing entertainment for events, parties, festivals, and corporate gatherings since 2003.
choreography, along with a talented line up of performers skilled at expressing their art forms. Available for performances of all sizes and types as well as lessons. To inspire positive life transformation in the hearts and minds of our audiences. With our roots firmly planted into the earth, we pay homage to our ancestors. 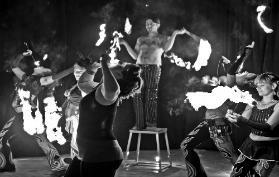 Our shows are in honor of the tribes that have fire danced before us.